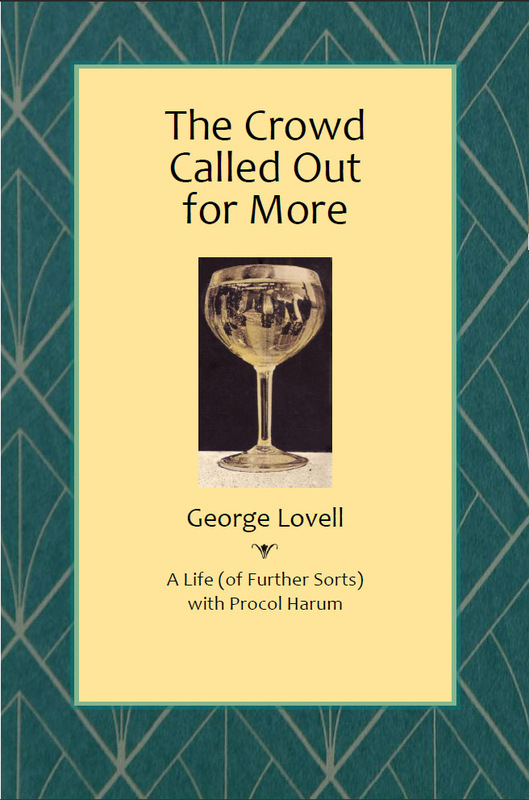 This second volume of George Lovell’s 'Life (of further sorts) with Procol Harum' winged through the post, not from his adopted domicile on Lake Ontario, but from his home town of Glasgow, as George was back in Scotland for a short visit. I knew George was planning an update of his two earlier editions of 'The Waiter Brought a Tray' (which I reviewed for BtP back in another decade) as we had met at the Festival Hall last Spring. I was delighted when asked to appraise this follow-up volume and find he had chosen a new ‘whiter-shade’ title for it. 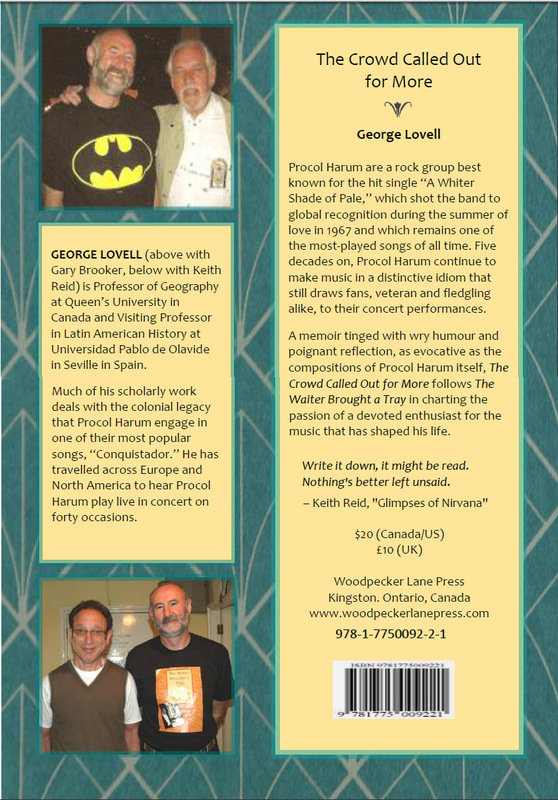 The back cover (below) displays pictures of George with both Gary Brooker and Keith Reid and biographical notes outline the enduring quality of the band, then describe the author as ‘a passionate enthusiast of the music which shaped his life.‘ Its own summing up of the qualities of the book challenges any reviewer to do better! One is promised ‘a memoir tinged with wry humour and poignant reflection, as evocative as the compositions of Procol Harum itself’ The publisher (or is it George himself?) puts it perfectly! Inside, my copy was signed to ‘Darling Charlie’ (not some mid-life affection, but a Scottish reference to a song about our Bonnie Prince of that name!) but the real dedication is “in fond memory of Long Tall Dave Ball, whose stallion stands and whose guitar still resounds”. I’m sure George is thinking not only of Dave’s finest hour at Edmonton, taking on a whole symphony orchestra in that dynamic new arrangement of Conquistador, but also his friendly bonhomie at Procol and Palers events along the way. George assures us in his preface he is Still Rambling On, and time spent with this book is indeed listening to him as a miller of memories, telling his tale with relaxed aplomb, encouraging you to skip that light fandango in his company. It’s a rich reminisce, particularly for those who know the cast of characters (though they’re well-enough described for any casual reader). George’s concern about sequels being ‘never any good’ is a misplaced anxiety - his half century in pursuit of happiness is a delightful read. We begin back in '60s Glasgow, with a B&W school photograph of the author, clean shaven and studious, whom George himself describes as ‘a youthful salty dog!’ This is quickly followed by a more hirsute studenty picture, as he progresses through the education process, picking up a fondness for Procol Harum along the way. George still retains the ticket for his first Procol concert in Glasgow in October 1970, round about the same time as I was also first exposed to our heroes. It was interesting that this Tir’na’Nog, Harum and Jethro Tull Greens Playhouse concert started at 11.30pm and ran through to 2.30 in the morning. Glasgow folk do like their late-night Friday revels. And they paid ten bob for the pleasure! After this illustrated Procol portfolio, we move forward to tack on to The Waiter brought a Tray with his account of 2010 US and Canadian concerts, starting in Boston, Canandaigua NY and Toronto. There’s the historic return journey to Edmonton for a third meeting of the band and their symphony orchestra. At some point Gary asserts “happiness is not one of the great Procol things.” George roundly reckons hearing In Held would put his happiness register off the scale! After one of the shows, he runs into Dave Ball and is taken along to The Sherlock Holmes bar for a noggin or two with the band. It was lovely to hear how, at the concert, Gary saw Dave in the audience and gave him a moment in the spotlight in this city which had been the highlight moment in his career. George often sets the scene with a meal, a drink or a meeting with friends; and he has an obvious love of the journey – through geography, history or life itself. His concert memories are detailed in the critique of the lyrics, the live playing of the music, his recollection of asides from Gary and the band and the meetings with that circle of friends – the band, management and faithful fans like Freddie, Al, Tito and Marvin. The banter is high-quality, as musicians occasionally take the michael of our learned author’s works on Guatemala and the Conquistadores! Everything is just right in its place and I don’t intend to single out many nuggets here. This is a rich narrative I can readily identify with, as one with a similar lifetime’s ‘affliction’ for Procol Harum. We move to Europe and Wuppertal, with its upside-down railway, for a pair of orchestral concerts and a Palers' Band gathering with a cast drawn from many continents (including cameo appearances from past and present members of Procol Harum). George renews friendships with Michael Ackermann and the BtP team, Jens and Roland – two contrasting characters with a unity of purpose if ever there was ... keeping that fabulous music alive by spreading the message far and wide. I met George in Germany and again ran into him in London prior to that Royal Festival Hall concert where Gary had us all concerned with his half-time tumble, but then in awe at his courage in returning as a wounded soldier to do the second half. Another memorable night was Procol’s return to Edinburgh after a forty-year absence to kick off the 2017 tour. George confessed to missing this, instead travelling to Berlin where he gives an excellent critique of Novum - I was pleased to find this fellow sentimental Scot of a certain age liking Sunday Morning, ‘the hymn to the ordinary man’. In a ‘coda’ of his own, George visits Martin Perez who has collected over a thousand covers of Whiter Shade and uses the nom-de-plume 'Awsop'. This proves to be a chance for them to delve into the catalogue, as well as discussing Hispanic history, which they both have a depth of knowledge and keen opinions about. But the highlight of their encounter proves to be when George identifies a moment in one of Martin’s live Procol recordings (from the Paradise Club in Boston) when he and Gary exchanged some good-quality Scottish banter about Glasgow and Kirkcaldy, prior to A Salty Dog. This small book is a joyous read for any Procol Harum fan, as George is writing for all of us who have travelled together over the past fifty years, albeit separately on our own life journeys. One hopes that for George, like Procol Harum, “Still There’ll be More.” With possible gigs in North America next year (even a cruise!) and Gary reckoning they might go on for years (and maybe with new material), a further volume is eminently likely. And given how George chooses the book titles, will he be telling his tale ‘skipping the light fandango’ or ‘turning cartwheels across the floor'?